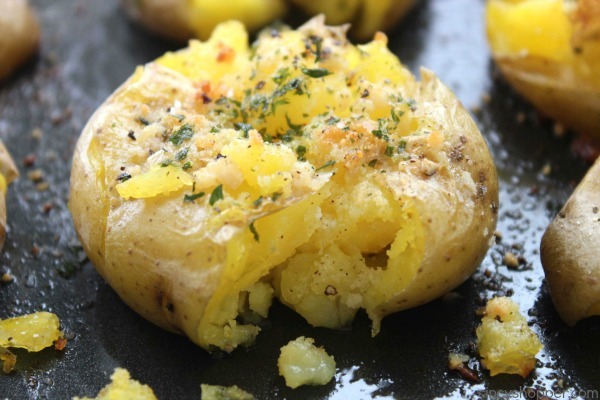 These Garlic Parmesan Smashed Potatoes are loaded with awesome flavors and make for an easy side dish. 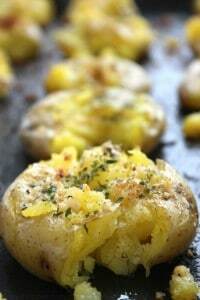 Super simple potato side dish to make for family dinner. Having quick and easy side dishes to pair with our meals makes homemade dinners so much easier. For Sunday dinner this week, I had a quick and easy spiral ham I tossed in the oven. I love how easy hams are but I was needing a new potato side to add along side. 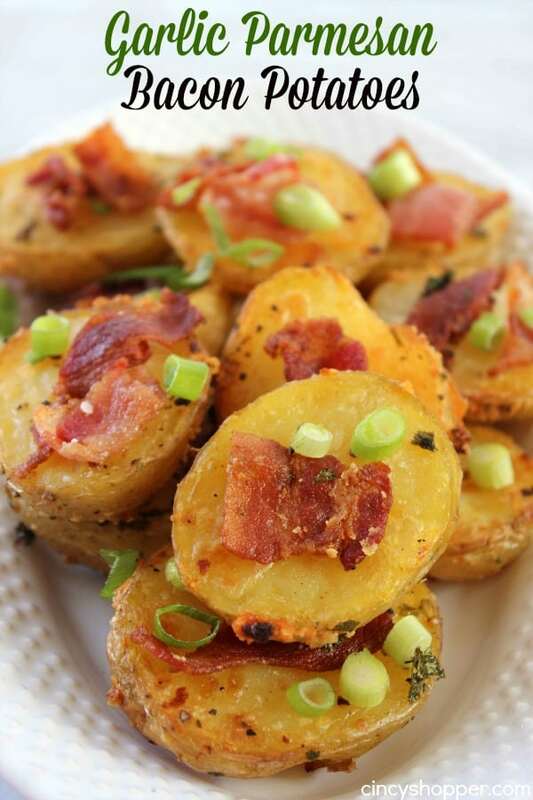 I had spotted this recipe for Crispy Smashed Potatoes over on Williams-Sonoma website. The potatoes sounded amazing. 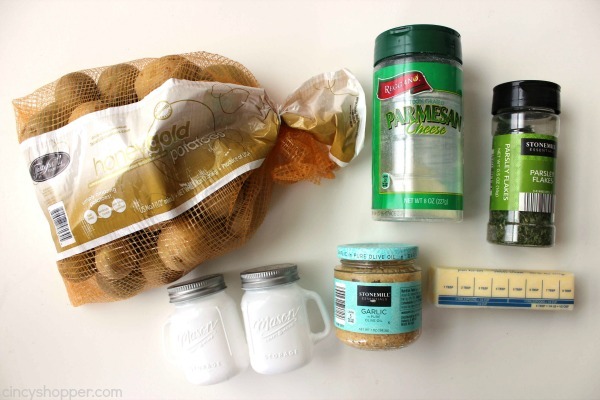 I set out to make our own smashed potatoes with garlic, parmesan, and lots of butter. 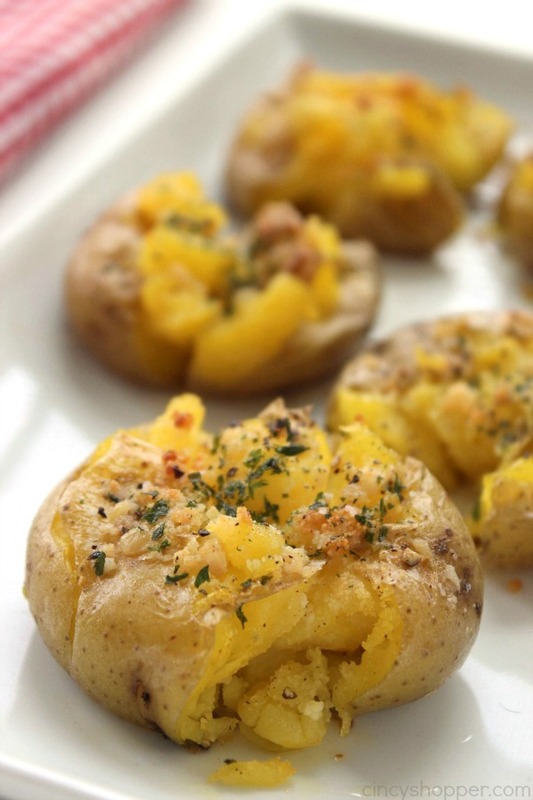 We are a potato eating family so this recipe was a big hit with everyone. The house smelled so good as they baked. The ham smelt great but wow, the potatoes had everyone extremely anxious to dig in. 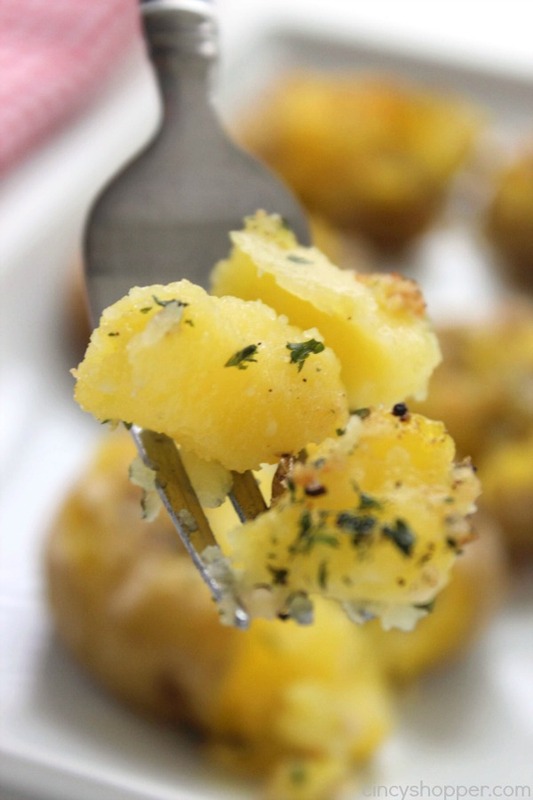 These are called Smashed potatoes because you use a potato masher or fork to “smash” them a bit before adding your toppings and baking. We smashed ours with garlic, butter, and parm. You could use other toppings as well. I was VERY pleased with our flavor combination. The recipe is so super simple. 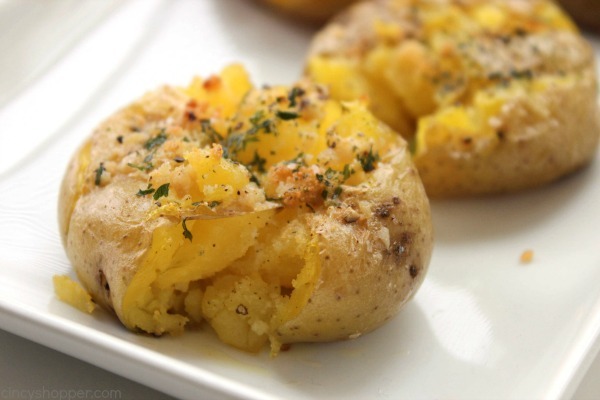 You will need some small potatoes, butter, garlic, Parmesan cheese, and some salt and pepper. I added in some parsley flakes but they are not needed if you do not have any on hand. 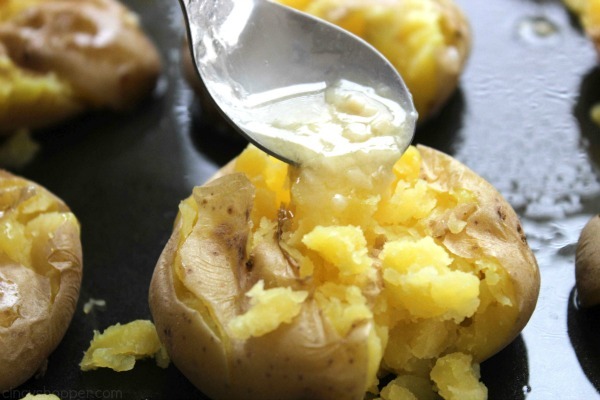 A quick boil of your potatoes then just smash, top, and bake. Super easy. 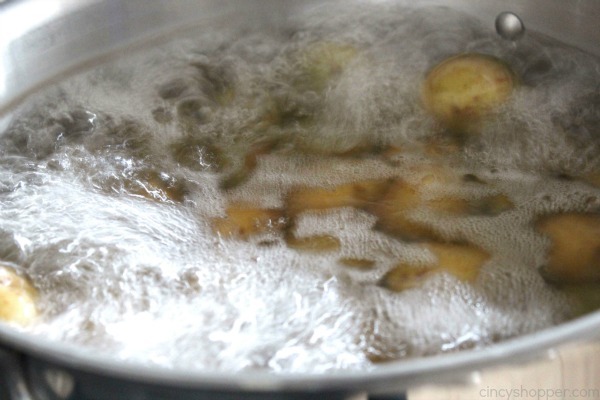 Put potatoes in a large pot and cover with water. Boil for 20 minutes until tender. Spray baking sheet with non stick spray. 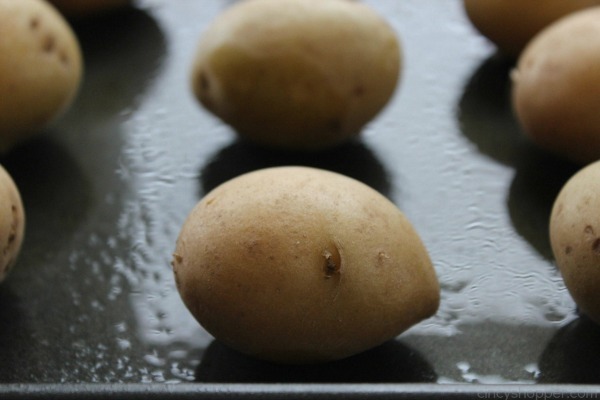 Place potatoes on prepared baking sheet. 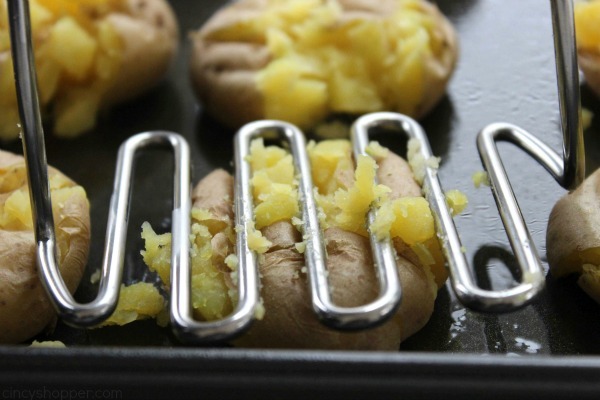 Using a potato masher or fork, gently mash each potato to slightly flatten. 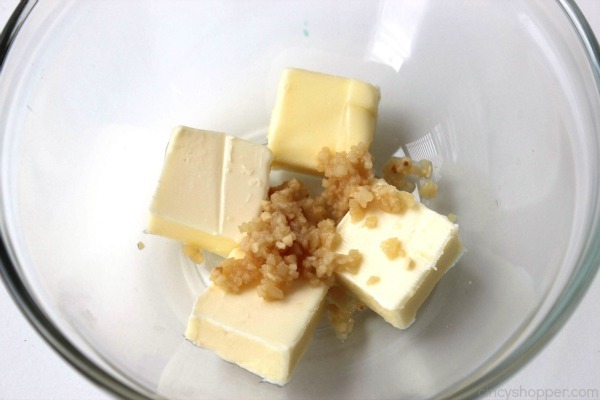 Mix together melted butter and garlic. 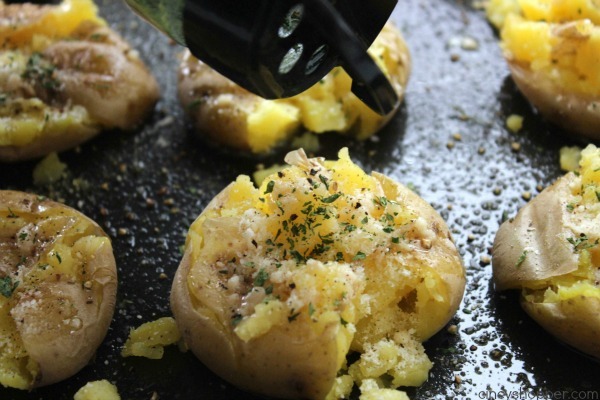 Drizzle each potato with garlic butter mixture. Dust with Parmesan cheese and parsley flakes. Bake for 20 minutes, or until golden brown. 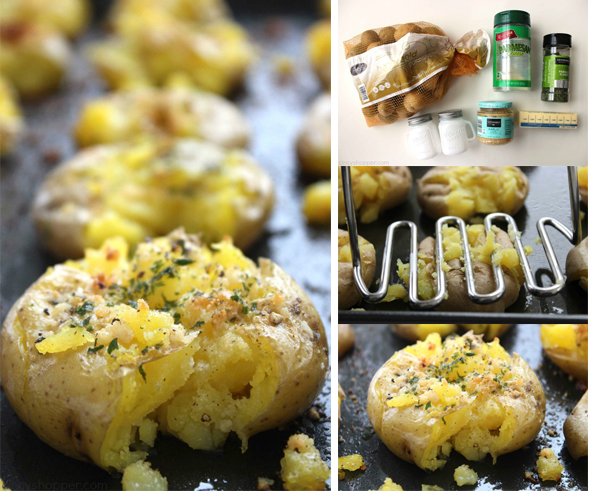 If potatoes are not browned enough broil for 1-2 minutes. 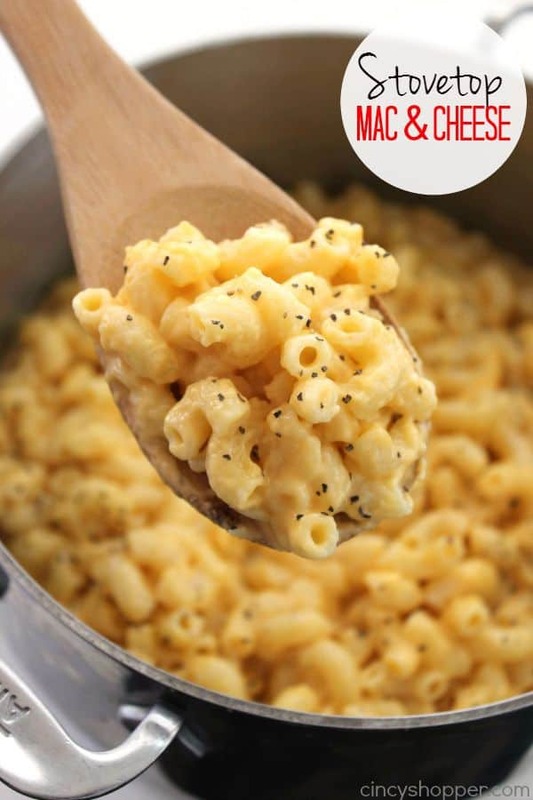 Do you have a favorite quick and easy side dish? 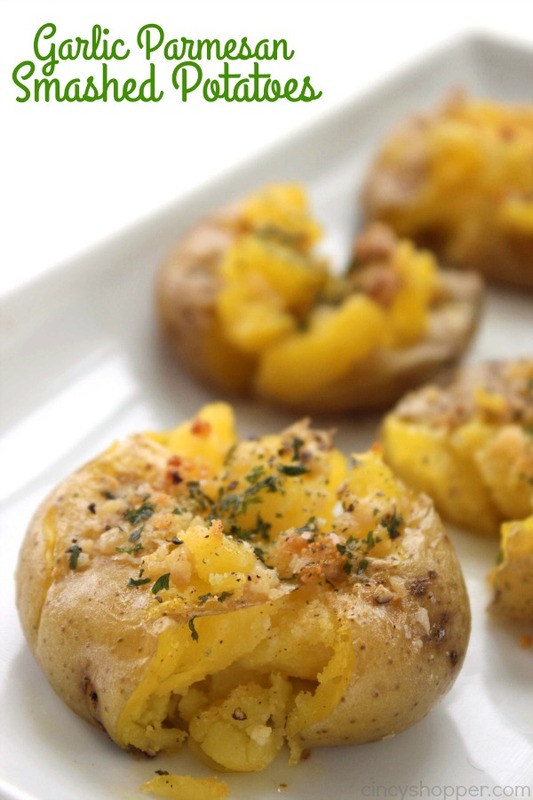 Looking for other quick and easy side dish recipes? 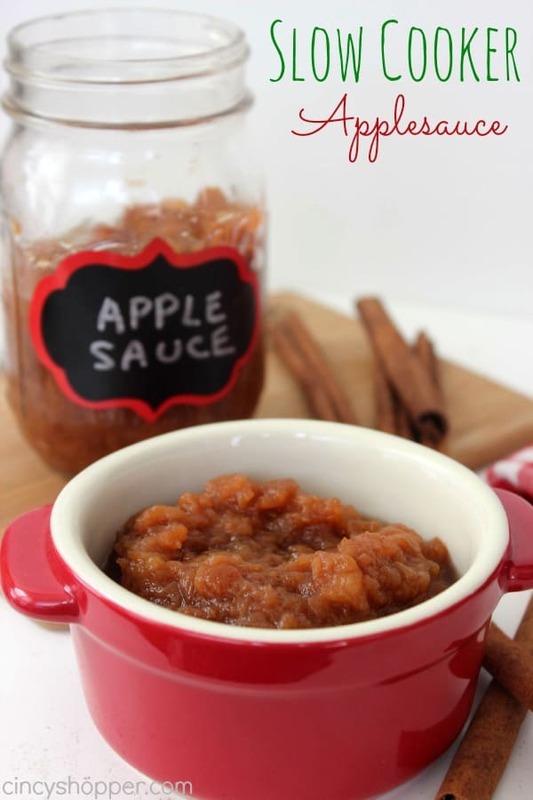 Be sure to see these other recipes that I have shared…. We’re a huge garlic loving family, and my husband is very much a cliche meat and potatoes guy – this is PERFECT for my house! I can’t wait to try it out, they look delicious! 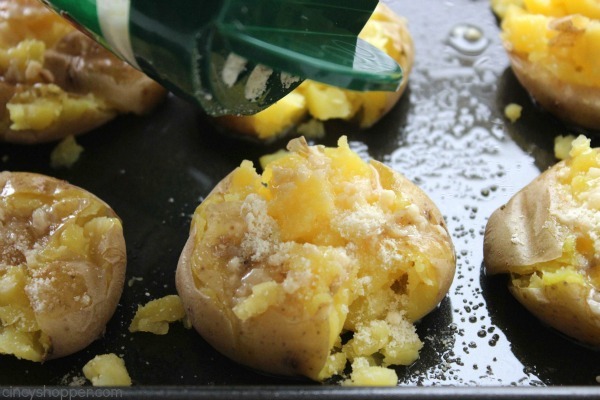 I love potatoes any way I can get them, but I have a special place in my heart for smashed potatoes… and this garlic-Parm version sounds delicious! YUM!! We are huge potato fans in our house, we eat them regularly! I am always looking for new ways to cook them so we can eat them cooked in different ways, we will be giving this recipe a try for sure. Thanks for linking up with Inspire Me Monday. Have a blessed week! Yum! I could eat this for lunch! I have the same potato masher tool in my kitchen and love it! Thanks for sharing your fabulous recipes with us at Merry Monday. Pinned.